Please join us for the Washington Seaplane Pilots Association’s annual splash in at Priest Lake, Idaho. Situated on lovely Cavanaugh Bay, Tanglefoot Seaplane Base (D28) is one of the most unique spots for seaplanes in the northwest if not the world. There is ample space for amphibs as well as straight floats and even for you wheel guys next door at the Cavanaugh Bay airstrip (66S). As of this writing, we are working on the final agenda, which will be announced in subsequent newsletters. We will have the same basic format as the last two years with a fly-out on Saturday and a reception, dinner and speaker that night. Meals will be provided Friday night thru the weekend, wrapping up with a continental breakfast on Sunday morning. Accommodations will include camping on-site or at the airport next door. We hope to offer some hotel rooms for rent in the coming months. We have a special treat for Friday night’s dinner this year. 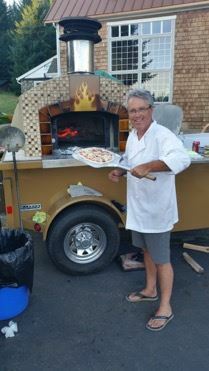 WSPA member, Everett Mellish has volunteered to bring his wood fired pizza oven. Based on the pictures below, this is surely to be a mouthwatering experience. We are also working on a catered dinner for Saturday night. In past years, we have relied upon contributions and a charge per plane, which has resulted in a less that breakeven weekend for WSPA. This year we plan to charge $50 per attendee (including your passengers), which will include all meals for the weekend. An announcement of the event will be sent to your email and you will be able to register and pay for the weekend thru the WSPA website (www.Washingtonseaplanepilots.org). There has been an ongoing area of concern in the number of operational events involving aircraft departing Spokane Felts Field (KSFF) westbound when Spokane International Airport (KGEG) RWY 21 is the active runway. The arrival course for KGEG RWY 21 is just above the outer shelf of the Class C airspace. This sets up a situation where aircraft are in close proximity in the arrival and departure stages of flight. (SEE Attached Map) As summer heats up, there will be more aircraft operations in the vicinity of KGEG and KSFF. Departing KSFF westbound without flight following can place small aircraft in close proximity to larger, potentially wake generating aircraft. To help alleviate this, it is strongly recommended that VFR departures from KSFF to the west request flight following prior to departure.